Above: outline of the flow of food and nutrients in the open ocean and on a coral reef. 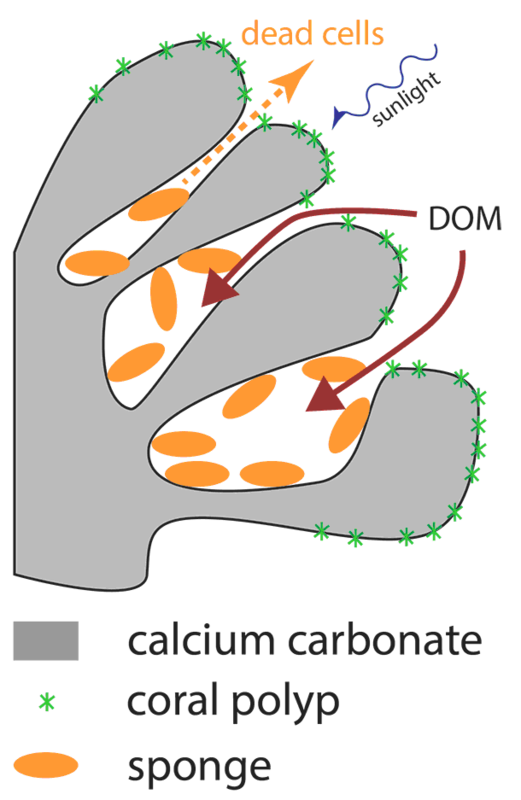 Above: Sponges arn't easily seen since they grow in the inner cavities of the coral. As described in Life on the Dock (LOTD), in the open ocean small phytoplankton which get energy from the sun, are the base of the food pyramid. 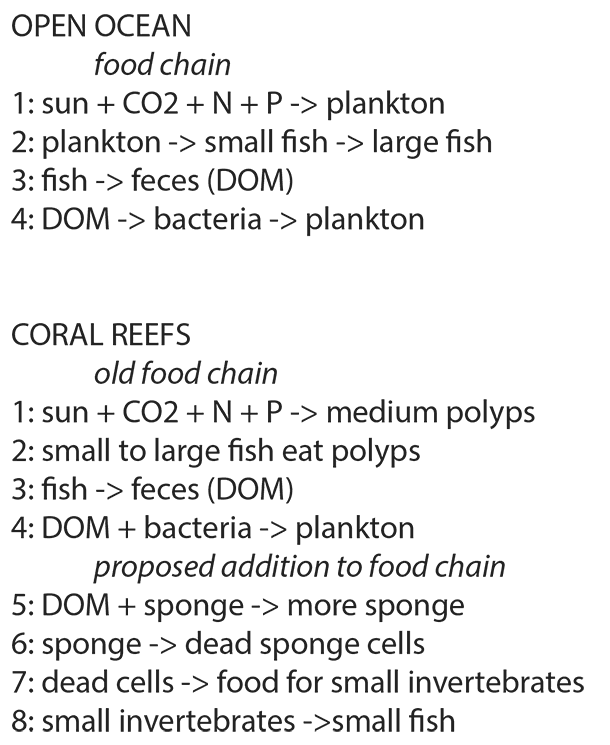 As summarized in the right sidebar, the phytoplankton are food for small animals, which are in turn food for medium sized animals, which are eaten buy large animals. If the concentration of medium and large fish is high (good for fishermen and divers), there must be an even higher concentration of small plankton, and thus the water tends to be cloudy. Coral reefs only grow in low latitudes, i.e. close to the equator. Usually the water near the reefs is low in nutrients, which means low levels of phytoplankton and fish. The water is clear, but not much is going on, it's a desert. However, on coral reefs marine life is teeming: lots of large and medium sized fish and everything else a diver or fisherman could dream of. That is the basic paradox. One of the items in HMS Beagle's sailing instructions was to survey and study coral reefs, since their remarkable biology had been reported by many previous explorers. It is only natural that Darwin would also become fascinated by coral reefs. He correctly deduced the geological history behind the formation of coral atolls, which form around an island that over millions of years sinks into the ocean, while the coral reef grows upward to create a circle enclosing a lagoon above the sunken island. In fact, publication of this theory when he returned to England established his scientific credentials before any work in biology. It has been known for many years that coral polyps contain a dioflagelate symbiote that carries out photosynthesis. Thus the polyp takes the place of the small phytoplankton in the open ocean. Coral polyps can be many mm in diameter, and the surface of corals is grazed by fish of many sizes. Thus, the food chain around coral reefs is quite different than the chain in the open ocean, in some cases it is inverted. You could think of the coral polyps as being analogous to grass growing in meadows, being eaten by cows and deer. The new insight  is that sponges play a large part in the food chain by adsorbing dissolved organic material, DOM. This enables rapid turnover of the filter cells (choanocytes), that can divide every 6 hours. The old, dead cells are expelled and become food for the smaller invertebrates of the reef, e.g. amphipods and polychaetes. These animals are in turn eaten by larger animals and so on. The feces of all animals are degraded by bacterial to regenerate DOM. Both old and newer pathways are just examples of recycling by the reef. It gets its energy from the sun, and recycles the organic and inorganic material. A small fraction of the nutrients must escape the reef, but on average it maintains a local environment of high biological productivity.